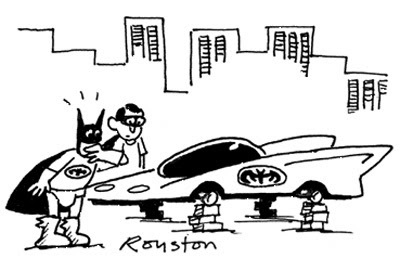 This cartoon is in the August issue of Prospect. I was pleased to sell this gag as it's one that I came up with while I was at the Shrewsbury Cartoon Festival (see May 3 entry) and therefore not at my desk trying to earn money! The general theme of the festival was "Size". 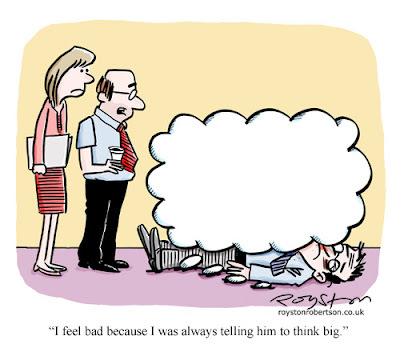 I have some cartoons for sale on the Cartoonstock website. They recently removed a handful because of a new policy of not featuring trademarked characters from films etc. Now, it's not necessarily copyright violation to feature such characters in cartoons, but the problem Cartoonstock run into is that they sell their cartoons to be used on mugs, mousemats etc. So then you could be seen to be exploiting the character. I think, actually, it's more of a problem overseas than in the UK, but I suppose it's all part of being a global business. Anyway, to be honest I wasn't that bothered as it was just a few gags and most of them were from very early on in my cartooning career. There is one I'm fond of though. 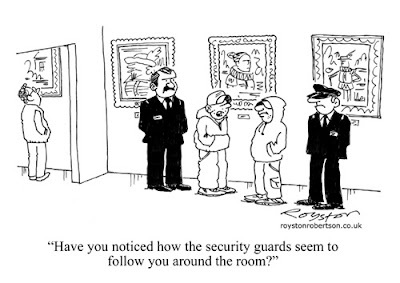 It was one of the first gags I had published. It was in The Times's Saturday supplement Metro (now defunct) circa 1998. Of course I'd draw it completely differently now (hopefully a lot better!) but it's still an OK gag I think. Note to DC Comics: please don't sue. I'm not planning on putting it on a T-shirt. This recently launched blog is definitely one to bookmark: A Gag a Day by my cartooning pal and fellow Cartoonists' Club member Tim Harries. It does exactly what it says on the tin, as they say. Or, indeed, as Tim says on the blog. "One gag published every day, unless I'm on my hols or get a bit bored," he adds. And here's some practical cartoon advice from the Andertoons blog. 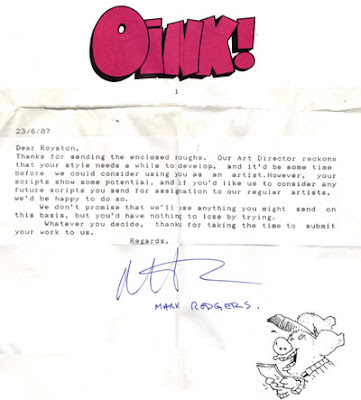 While having a bit of a sort-out, I found a rejection slip from Oink comic from 1987 (it was kind of a Viz for kids). It was probably the first rejection slip I ever got. I was 19 years old and, being a teenager, was depressed by it and never sent them anything else! But what's interesting to me now about it, after years of bog-standard "sorry, no thanks" rejection slips, is the fact that it's a proper letter and is incredibly positive. If I got a rejection letter like this now I think I'd be pretty happy about it! 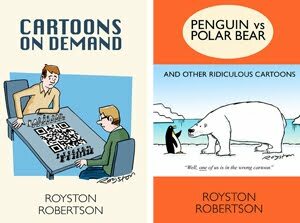 Many thanks to cartoon blogger Clangnuts for linking to my blog with a rather nice review. Clangnuts says: "I've been a printer, postman, weekend hippy, driver and support worker, but underneath all of that I've always been a cartoonist." I know that feeling. 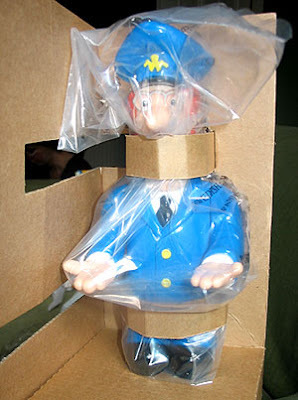 Toy manufacturers, why not package Postman Pat in such a way that it looks like he's about to be dumped in the river by the Mob? My son was unperturbed, but you must admit it is a bit sinister. There's real fear in those eyes. I recently set up a Myspace page, mainly to increase my web profile and provide a link to my main cartoon website. The "social networking" side of it is quite fun, up to a point (it's slighty bizarre when you get a link request from someone who seems to be online purely to show their bum to the world). I have discovered some good cartoonists that I wasn't aware of though, which is good. Now, not being as great a reader of Terms & Conditions as I should be, I didn't know that putting your work up on Myspace effectively granted them a licence to exploit it, potentially for profit. But as soon as I became aware of this appalling situation I found out that it had been changed, and all rights now remain with the artist. So who managed to get Myspace to make this amazing U-turn? Who d'ya think? This one is in the July edition of The Oldie. I enjoyed doing the "Mock Tudor" paintings!